On August 21, 2006, I was sworn in as the 37th member of the National Transportation Safety Board. At the same time, I was appointed by President George W. Bush to serve as NTSB Vice Chairman. In 2011, President Barack Obama reappointed me for an additional five-year term as a board member. 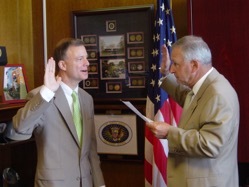 Robert Sumwalt, taking the oath of office, administered by then-NTSB Chairman Mark V. Rosenker on August 21, 2006. As I reflect on 10 years as an NTSB board member, there are several things that stand out. First, is the mission. Our role in transportation safety quickly became apparent when, on my seventh day on the job, I launched to an airline crash in Lexington, Kentucky. Tragically, that crash claimed 49 lives. But, the NTSB’s primary mission involves more than just investigating accidents. It also involves determining the cause of accidents, and then, most importantly, issuing safety recommendations to prevent future accidents. At the entrance to our training center, we have an etched glass window that says, “From tragedy we draw knowledge to protect the safety of us all.” And that’s exactly what we do – we learn from tragedy so we can keep it from happening again. Yes, we are here to give a voice to those who don’t have a voice—the victims and their families of transportation accidents. I take great solace knowing our work really does make a difference and keeps others from enduring similar tragedies. What also stands out to me is the dedication of the men and women of the NTSB. Their passion and determination to find the truth is uplifting. In the most recent employee viewpoint survey, 96 percent of respondents replied positively to the statement, “When needed I am willing to put in the extra effort to get a job done.” That demonstrates the commitment and dedication NTSB employees share for fulfilling our mission. In addition to investigative activities, there is a proactive side to the NTSB. Our staff conducts safety studies, tracks and follows up on our safety recommendations, and advocates for safety improvements by providing testimony on safety issues, promoting our Most Wanted List, bringing important safety issues into the public discussion via social media efforts, and organizing safety events such as roundtable discussions. 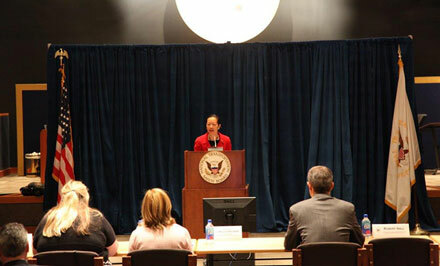 One of the NTSB’s values is transparency; we are open and honest with the public about our work. We post on our website all accident reports and publications, as well as the docket for each accident. The docket provides reams of background information for accidents, such as interviews, photos, and technical information that may not be in the actual accident report. Our board meetings are webcast and open to the public. And, our Office of Safety Recommendations and Communications ensures the media are informed of the status of investigations by answering questions, arranging interviews, issuing press releases, and releasing updates through social media. Many are surprised to learn that the NTSB also serves as a court of appeals for pilots, aircraft mechanics, and mariners who receive violation notices from the Federal Aviation Administration and U.S Coast Guard. The NTSB’s Office of Administrative Law Judges (ALJ) processes those cases, and our three ALJs hold hearings to adjudicate those matters. The NTSB’s Office of Transportation Disaster Assistance – a highly trained group with expertise in social services, emergency management, and forensics – works closely with various organizations to meet the needs of disaster victims and their families. This group also serves as the primary point of contact for family members and disaster victims, providing updates regarding the status of NTSB investigations and addressing their questions. It takes a special person to do the work they do, and I’m always appreciative of how well they do it. There are other parts of the agency that aren’t often acknowledged, but nevertheless are important to allowing the agency to function. As in any organization, job openings need to be posted and filled, bills paid, contracts written and executed, and our computers maintained. The employees who perform these functions are as dedicated as those performing the agency’s core mission. To put it simply, I’m so proud to be part of this agency. Our mission, independence, transparency, and people are all so important. I’m honored to have served with them for the past 10 years. Robert Sumwalt is an NTSB board member. Three ideas serve as the foundation for successful family assistance: empathy, compassion and the golden rule. Seemingly simple, these three concepts provide essential guidance for emergency managers who find themselves working with family members in the aftermath of a transportation disaster. 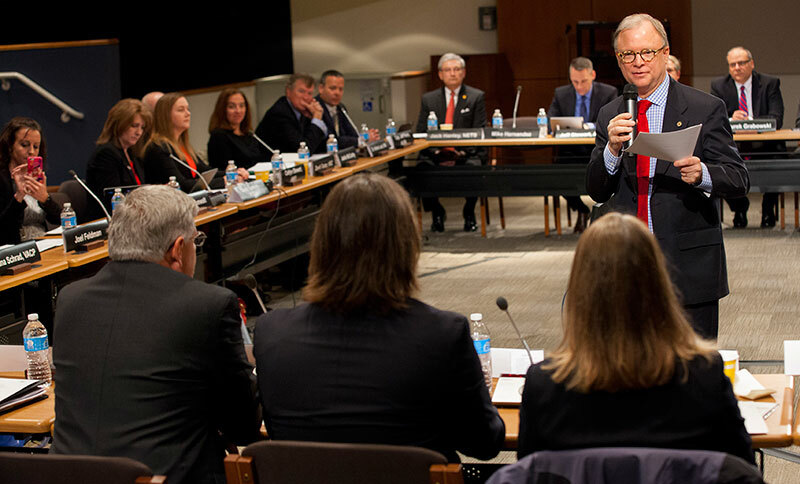 On May 7, 2015, the NTSB’s Transportation Disaster Assistance division hosted the agency’s first formal meeting of passenger rail professionals from across the country. Participants from as far as San Diego, CA traveled to Washington, DC to connect with the NTSB, Amtrak, the American Red Cross and other passenger rail agencies and exchange ideas regarding not just establishing, but improving their family assistance plans for the aftermath of a major accident. The focus on including family assistance in emergency response operations is especially important to NTSB Vice Chairman Dr. T. Bella Dinh-Zarr. Vice Chairman Dinh-Zarr opened this month’s conference by providing a great example of her family’s daily reliance on passenger rail lines. Both she and her husband use commuter rail during the work week and frequently take the train on weekends for sightseeing excursions or to visit with friends and family. With such large numbers of people utilizing the rail systems, the focus on family assistance in the aftermath of an accident is an important aspect of emergency response. 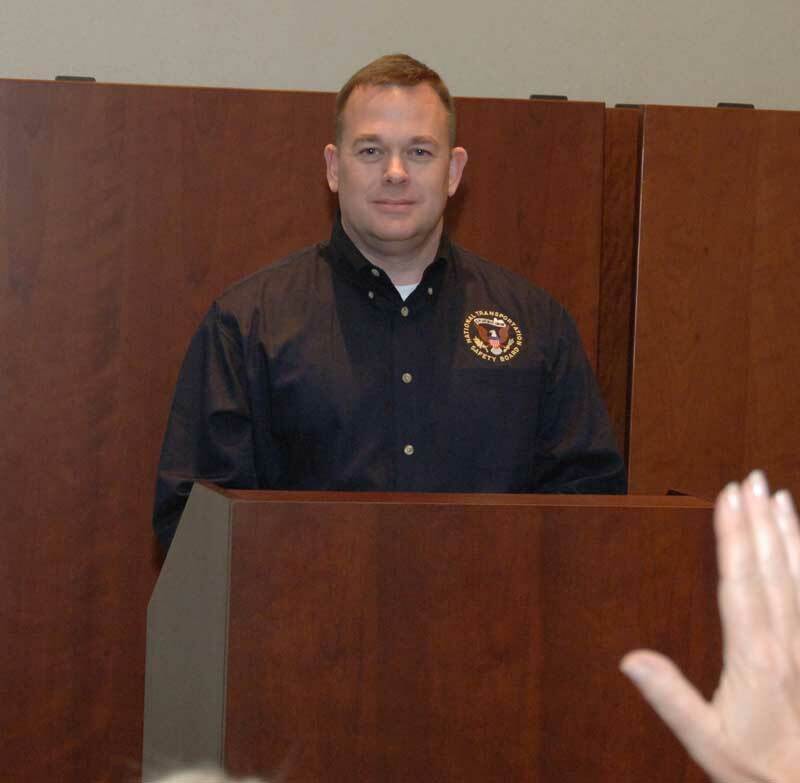 Max Green, Emergency Operations Coordinator for the NTSB’s Transportation Disaster Assistance division highlighted key aspects of a successful family assistance operation. He emphasized the importance of the initial interaction with family members and addressing their concerns. For a rail carrier, notification of a loved one’s involvement in an accident is an important aspect of family assistance. Although it may be difficult to determine who was onboard without a manifest, it is important that carriers provide as much information as possible to the local emergency manager to properly account for those involved. Max further emphasized the rail carrier’s responsibility in making contact with affected family groups as soon as possible. News today travels quickly and families will likely know about an accident through websites and social media before a company is able to issue a formal press release. Establishing a plan for timely notification of involvement provides the carrier with an opportunity to take responsibility, offer condolences, provide accurate information, assign a point of contact, and offer available resources and assistance. Amtrak provided a strong presence during the conference with 7 participants and 3 presentations. Susan Reinertson, Vice President of Emergency Management and Corporate Security, and Mary Carlson, Senior Manager of Training and Exercises, provided an extensive overview of Amtrak’s commitment to family assistance operations through preparedness and community collaboration. Although Amtrak is legislated by Congress to provide family assistance to its passengers after an accident, they strive to go beyond the assurances required by the 2008 legislation. Several times a year, Amtrak conducts emergency response exercises that include family assistance operations. Mary Carlson spoke about a full scale exercise in Chicago in which Amtrak and its community partners established a family assistance center and recruited volunteers from major air carriers to role play as family members to allow Care Team members practice their roles and the caring provision of services. Through this dedication of time and resources, Amtrak continues to emphasize the importance of caring for its employees, passengers and their families before and after an accident. Agencies present at the meeting included: All Aboard Florida, Charlotte Area Transit System, Herzog Transit Services Incorporated, Keolis Rail Services Virginia, Maryland Transit Administration, North County Transit District, Southeastern Pennsylvania Transportation Authority, Utah Transit Authority, Virginia Railway Express, and Washington Metropolitan Area Transit Authority. Although the majority of the attendees are not required by law to provide family assistance to its passengers after an accident, their attendance and participation demonstrates a commitment to customer service and “doing the right thing” even when no one is watching. Paul Sledzik, Chief of the NTSB Transportation Disaster Assistance division, often reminds stakeholders that “when all else fails, remember these three concepts: empathy, compassion, and the golden rule” during all interactions with family members. When an emergency manager is able to view each step in the process with those concepts in mind, the operational planning will remain focused on taking care of the customer and continuing to provide the best service possible for the given situation. Katy Chisom is a Coordinator of Victim Services for the Transportation Disaster Assistance division within the NTSB Office of Communications. To view the round table session in its entirety, see the webcast. Distractions come in all forms, ranging from rowdy kids in the back seat to using electronic devices to stay connected. We acknowledge the different forms of distraction, but decided to keep the roundtable focused on electronic distractions. And, while distracted driving awareness month deals primarily with driving distractions, we expanded the scope of the roundtable to include all modes of transportation. After all, the goal of the NTSB is to ensure safe transportation for all travelers, regardless of how they travel. I was thrilled to facilitate the discussions. The real stars of the roundtable were the participants—a diverse group of about 40 safety experts, regulators, scientists, researchers, advocates, engineers, insurance representatives, industry, law enforcement, and victims of families. They came from the ranks of aviation, highway, marine, rail, and transit. They all shared their viewpoints about how best to disconnect from deadly distractions. The specific objectives were to 1) raise awareness for the need to disconnect from deadly distractions by having a conversation that focuses on the multimodal aspects of distraction, 2) promote cultural change, 3) discuss how the various technologies can increase the potential for distractions, and 4) find solutions to reduce distraction. Each week this month, I will blog about some element of deadly distractions. I look forward to hearing from you. Meanwhile, I encourage you to disconnect from deadly distractions. Tragedy stresses the bonds of love with unimaginable force. Each of us faces the death of a loved one with an individual response, making generalizations difficult. In our work in Transportation Disaster Assistance, we’ve seen the entire range of response, from anger to incredible grace and understanding. Some families use their grief as the catalyst to ensure others don’t suffer a similar loss. We see this often in the aftermath of transportation accidents. Not wanting the loss to be in vain, and to honor their loved one, they advocate for improved transportation safety. Some do it alone, while others form associations with others who lost family in the same accident. Sometimes, families join together to focus on a specific transportation safety issue that goes beyond the accident to prevent future losses. More often than not, they look to the NTSB recommendations as a source of independent information to focus their advocacy efforts. 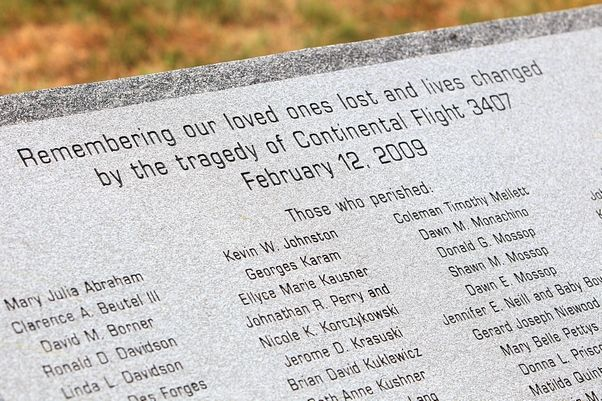 The family members who lost loved ones in the crash of Continental Connection flight 3407 in 2009 are a remarkable example. Their efforts for substantial improvements in aviation safety resulted in the passage of the Airline Safety and Federal Aviation Administration Extension Act of 2010. This week marks the 6th anniversary of that accident, and the families were on Capitol Hill last week to continue their advocacy during the FAA reauthorization hearings. Many of us are aware of the efforts of Mothers Against Drunk Driving, which grew from a mother who lost her daughter to a national movement. Similar grass-roots groups or individual families promote safety in wide range of transportation modes including fishing vessels, cruise ships, motorcoaches and school buses, trucks, and highway and auto operations. The Survivors Network for Air & Surface Medical Transport, created by survivors of air medical accidents, supports survivors and family members of air and surface medical accidents and works with operators to mitigate risk and improve safety. 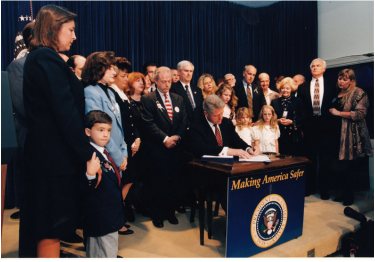 President Clinton signing the Aviation Disaster Family Assistance Act of 1996. Family members have sometimes taken on advocacy to improve the treatment of other families who have endured losses in accidents. The Aviation Disaster Family Assistance Act of 1996, which began with a grass-roots effort by family members impacted by major aviation accidents in the mid 1990s, has had a profound effect on improving the services and information families are provided following major aviation accidents in the US. Similar rail passenger legislation was passed in 2008. The implementation of family assistance continues around the world. Last year, with the urging of aviation accident family member organizations from around the world, the International Civil Aviation Organization passed a policy document promoting the humanitarian support that countries and operators should undertake to effectively support family members and survivors after aviation accidents. Nations including Japan, Brazil, China, South Korea, and Australia, and the countries of the European Union have crafted aviation family assistance legislation that ensures appropriate support for families and survivors. Family members who suffered through poorly coordinated accident responses in the past have worked to pay their efforts forward to other families they will never know—the ultimate act of compassion. Transportation systems move people so that they can conduct business, enjoy a holiday, or spend time with loved ones. When an accident happens, the impact is often measured by the human element. The resulting individual suffering, although sometimes played out publically, is very private. Family members who bravely step out of their private suffering to honor their loved ones are truly acting out of love for all of us. 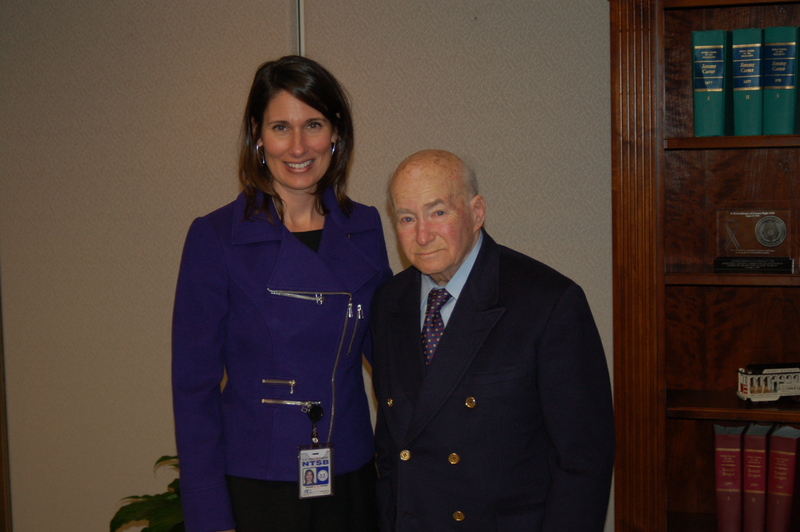 On October 18, the aviation community lost a giant among men: Hans Ephraimson-Abt. In his New York Times obituary, the headline described him as an “Air-Crash Victims’ Crusader.” I couldn’t help but think how aptly the term “crusader” fit him, for he applied every means at his disposal to advance victims’ issues for decades. There is no doubt that the positive changes we have seen in the way air crash victims and their families are treated in the aftermath of a transportation tragedy is due in no small part to Hans’ efforts over the last 30 years. For those of us in this line of work, we know all too well Hans’ personal story of the tragedy of his daughter, Alice, and the ill-fated flight of Korean Air Lines flight 007. But perhaps what is more remarkable is that in all the years that I worked with Hans, I never sensed any bitterness or resentment in him. Through the decades, as he faced seemingly insurmountable obstacles to get a law passed, or an international treaty signed, he never took “no” for an answer. He knew he could not win every battle, but he never gave up the fight. As a crusader, he was fierce and dogged in his determination. But he was always the diplomat and the gentleman. A few weeks before his passing, when we were together at the 38th General Assembly of ICAO in Montreal, there he was, engaging another delegate or ambassador to support the ratification of the Montreal Convention or the new ICAO policy on family assistance in air disasters. This past spring, Hans invited me to attend a small private reception at the home of the consul general for the German mission in New York. With his children, grandchildren and a few dear friends in attendance, he received the Order of Merit, one of the highest civilian awards bestowed by the Republic of Germany. To me, it was a climactic moment in Hans’ life. Here was a man whose family had fled his native Germany on the eve of World War II, spending time in work camps, not knowing where his parents and family members were. Years later, he emigrated to a new life in New York, where he was reunited with his parents. Yes, Hans was a crusader but he was also a survivor. And because he knew firsthand about the mistreatment of others, he made it a point to rise above it. He never had a bad word to say about anyone. He demonstrated through his life’s work that you can always be kind and courteous even when you disagree. Hans didn’t take to compliments easily. He would demur if you wanted to heap praise on him. But as I stood and witnessed that event in New York, I could see how deeply he was touched by the honor bestowed on him, for his selfless contributions, and this one time, he accepted the recognition he so deserved. When I saw him at the ICAO meetings in Montreal, on his lapel, he wore the ribbon that accompanied his medal. As always, he was gracious and kind in our meetings. As always, he urged us to continue the crusade. With his passing, a new leadership will take up the cause that he began 30 years ago. And like Hans, we can’t win every battle. But if we remain true to our cause and to ourselves, then one day, perhaps we can fully realize Hans’ crusade for compassionate treatment of all survivors and victims’ families in the aftermath of aviation tragedies.